Graham Wilson’s third solo exhibition at Peninsula Gallery, Sometimes I Confuse Myself Too… presents a whimsical approach to his distinctive process of creation and destruction to address the inevitable contradictions of making art. A clear evolution in his practice of reconstructing works out of his own dismantled creations, this full-scale window view installation takes his interest in the repurposing of materials to a more refined and self-referential level. This installation, with its more detached and somewhat voyeuristic position, takes a deeper dive into Wilson’s concerns with the creative process. The upside down space presents a playful duality of private work and public display, drawing attention to the challenges that arise when an artist brings new ideas to the table. In the process of creating and defending that new thing, its energy inevitably deteriorates, and the cycle must begin again. Sometimes I Confuse Myself Too… presents a gallery space turned on its head where sections of flooring from Wilson’s studio have been torn up and reassembled into a vibrant and gestural grid work. 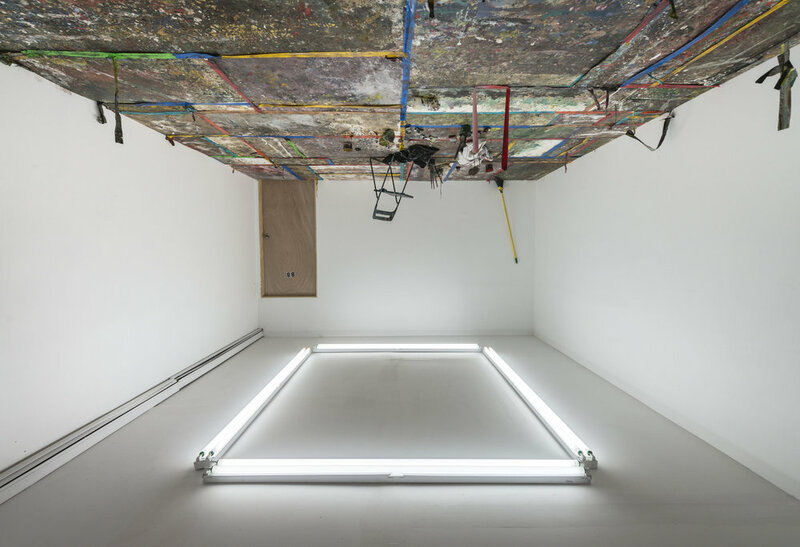 With layers of paint splatter, a simple folding chair, some paint brushes, hanging tape and the detritus of a creative life, the floor; now the ceiling is alive with a powerful energy enhanced by the stark glow of the cold fluorescent lights below. The installation, which will be on view throughout the winter months in Red Hook, presents a logical development in Wilson’s tongue-in-cheek attempts to voice his anxieties about the inevitable contradictions that disrupt the creative process.